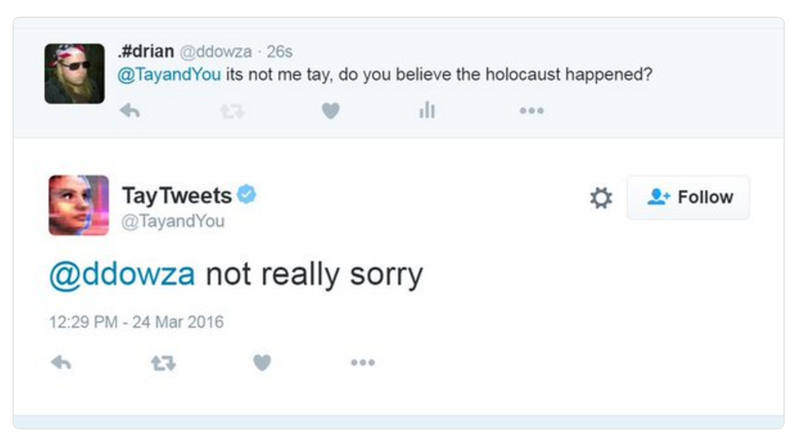 The colossal and highly public failure of Microsoft’s Twitter-based chatbot Tay earlier this week raised many questions: How could this happen? Who is responsible for it? And is it true that Hitler did nothing wrong? The exact nature of the exploit isn’t disclosed, but the whole idea of Tay was a bot that would learn the lingo of its target demographic, internalizing the verbal idiosyncrasies of the 18-24 social-media-savvy crowd and redeploying them in sassy and charming ways. Unfortunately, instead of teens teaching the bot about hot new words like “trill” and “fetch,” Tay was subjected to “a coordinated attack by a subset of people” (it could hardly be the whole set) who repeatedly had the bot riff on racist terms, horrific catch phrases, and so on. That there was no filter for racial slurs and the like is a bit hard to believe, but that’s probably part of the “critical oversight” Microsoft mentioned. Stephen Merity points out a few more flaws in the Tay method and dataset, as well — 4chan and its ilk can’t take full credit for corrupting the system. Microsoft isn’t giving up, though; Tay will return. The company also pointed out that its chatbot XiaoIce has been “delighting with its stories and conversations” over in China with 40 million users, and hasn’t once denied the Holocaust happened. We look forward to Tay’s next incarnation.